If you recall, I had two very successful garage sale trips. (here and here). Slowly, I have been plugging away at trying to turn the thrifty into nifty. With a little bit of sanding and two coats of MMS Grain Sack, the mirror was showing potential. I decided then to dry brush it with MMS Linen for added interest and give it a quick distressing. I thought I was done, but it just didn’t look right to me. I have said this before, but the best thing to do when stumped… is to walk away. I did just that and it worked. An idea popped into my head immediately when I looked at it again with fresh eyes. It needed some detail, something of interest… a stencil. It worked! I am pleased with the end result. Just enough interest! I am so happy it was just that easy, now onto the next. Have you completed any new DIY projects? It is so rewarding to see the result of hard work! Thanks for sharing this lovely up cycle. It looks fresh and bright! 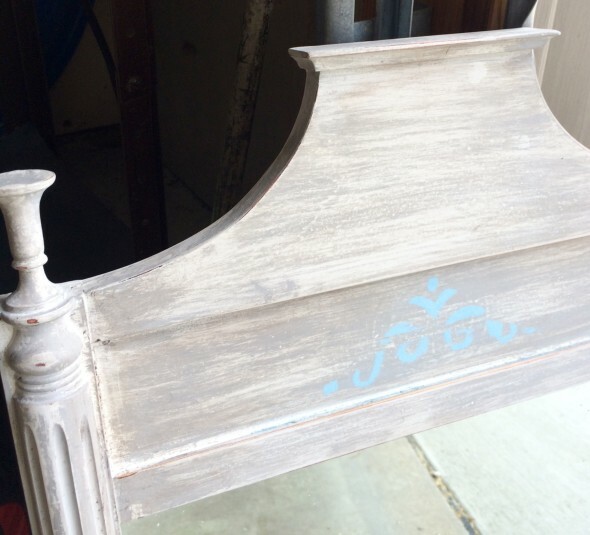 That is one lovely upcycle! Fresh and lovely! Hi, I wanted to let you know that this post was in the TOP Six most clicked on Fridays Blog Booster Party#12 and will get special mention on Friday. Well done. It looks really nice indeed. A brand new mirror. This is a great transformation. I love refurbishing good will finds. There is such a sense of satisfaction! 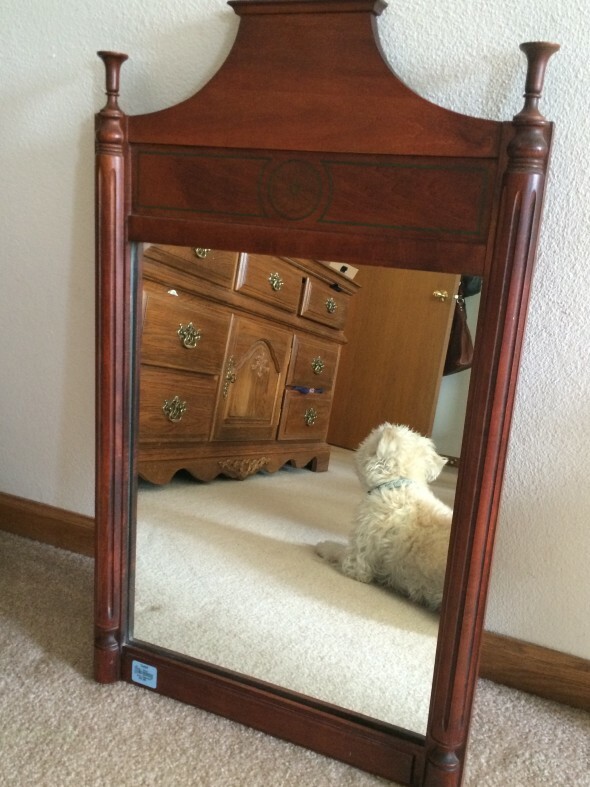 I am very impressed with your first photo with the little dog reflection that is awesome. You have such fun with your finds it must feel very satisfying to express your creativity. I love that you share them on Fridays Blog Booster Party. You are right, that mirror has great bones, I love how you personalized it, and the end result is fab! Great job! So pretty, Mary! You’ve for an eye for making drab beautiful. 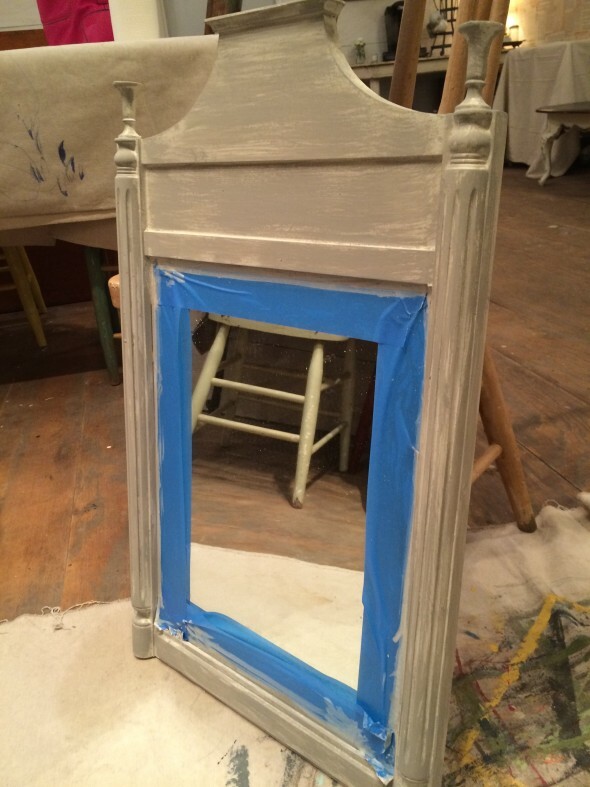 I love how you freshened up that mirror and took it from dark and drab to bright and beautiful! I’ve heard great things about MMS paints. I really need to try them. The walking away trick does, indeed, work. Beautiful! I think it looks great! What us MSM grain stack? Where do you get it? The end result is so much better, Mary. I like the interest it brought and I am gonna take that “walking away advice”. Ooo! That’s so pretty! You have such an eye for these things! AND…Thanks so much for taking the time to link up with us at the #HomeMattersParty – we hope to see you again on Friday!